It’s a phenomenon that has been around since the dawn of time, growing slowly worse and worse with each generation. With the advent of the internet and video phones, it’s easy to make fun of and hurt other people without even touching them physically. It’s a cowardly act, just to gain some kind of sick pleasure from the obvious psychological pain of others, and it’s even worse when you’re a teenager who’s just discovering what you (and your body) can be capable of doing. Pushing these biological changes into an exaggerated metaphor for puberty is Stephen King’s novel Carrie, released in 1974. Focusing on the story of Carrie White, high school senior and daughter of a deeply-troubled Fundamentalist Christian mother, Carrie was King’s first published novel, soon turning into a breakaway hit that spawned not just one, but two theatrically-released filmed adaptations, the latter of which hits theaters today. Trying to dismiss Kimberly Peirce’s new film as merely a remake of the 1976 Brian DePalma classic is like saying John Carpenter “merely remade” Howard Hawks’ The Thing From Another World with his version of The Thing in 1982. Both updates of Carrie and The Thing were borne of previously published novels; each director took the source material and ran with it in their own way, each putting their own spin on it without looking long at the familiar to only skate by with the minimum of effort. The 1976 Carrie and the 2013 Carrie bear little resemblance to each other, as each filmmaker’s style speaks to the different times in which they were released. Peirce’s Carrie seems to fit in with the spate of teen horror movies that populated the late 1990s – dynamic young talent, smart direction, a fast pace (which sometime feels a bit rushed for my taste), and a hip soundtrack for the record stores. In not being a simple remake of DePalma’s film, Peirce’s work stands on its own as a modern cautionary horror allegory. At the center of this production is Chloë Grace Moretz, whose remarkable performance as Carrie White gives this movie a solid anchor as she goes from being a sheltered, cringing teen to being a self-confident and fully-realized telekinetic. Seemingly in a matter of days, her body and mind throw a fairly violent coup d’état, starting with the circumstances surrounding her first menstruation. 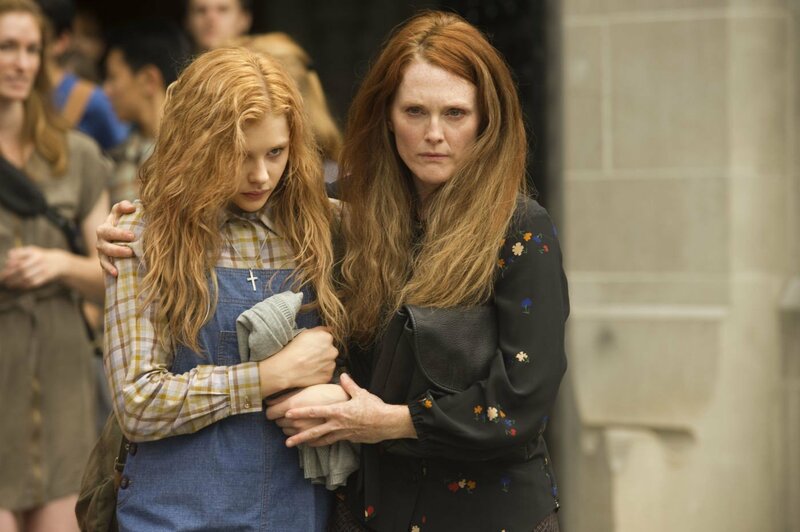 As her religiously-driven mother Margaret (Julianne Moore, in a suitably creepy performance) hasn’t told her about this part of life, Carrie bewilderedly freaks out in front of her gym class, where Sue Snell (Gabriella Wilde) and the other girls taunt her while bad-girl Chris Hargensen (Portia Doubleday) captures this rank humiliation on her phone’s video camera, later angrily posting it to YouTube to maximize the degradation. The bullying, the menstruation, the hormones, and the emotion collide dramatically and bring out the film’s X-factor: Carrie’s telekinesis. Blessed (or cursed, depending on how you look at it) with this newfound talent, Carrie slowly starts to take control of her life. For perhaps the first time in her existence, we actually see her smile; growing up with a mother whose every declaration of sin and punishment couldn’t have possibly led to much happiness, and the kids at school have apparently had it in for her since the sixth grade. Over the course of the film, we see Carrie transform into an upright, stunning prom-goer, having landed a date with the school’s lacrosse hero, Tommy Ross (Ansel Elgort). However, there’s mischief afoot, and it’s not long before Carrie’s world comes crashing down, literally, with disastrous consequences. Kimberly Peirce’s Carrie seems to have more of a social commentary inherent within. Mothers like Margaret White are all over the internet and the news today, professing total love and trust in the Lord and negating any notion of scientific help or wisdom. We hear a lot about bullying, both in-school and online; in fact, I’m writing this one day after GLAAD’s Spirit Day, encouraging the end of LGBT bullying. Peirce tackles issues like these with a sharp skewer and a nod to familiar pop culture staples and idiosyncrasies. You can almost feel the Westboro Baptist Church’s Shirley Phelps-Roper being channeled through Moore’s performance, which (to me, at least) makes it scarier than Piper Laurie’s Oscar-nominated portrayal of the same character. Portia Doubleday’s appearance as Chris Hargensen slings the appropriate amount of mud in the eyes of the fake-tanned, overentitled, my-daddy-will-get-me-out-of-anything bitchy teenager that populates MTV and various reality shows. It’s great to see them get their own comeuppances, but boy, do they have a way of making us hate them so, and it’s due to Peirce’s choice to keep her vision of Carrie as grounded as possible, with Carrie’s own supernatural abilities being almost the only unrealistic thing about the movie. As Carrie, Moretz emotes this whirlwind of change perfectly, summing up all the confusion, wild-eyed anger, hope, and happiness that come with being a teenager into the space of mere days in the film’s timeline. If you take the telekinesis angle out of the story, you’re left with how modern-day teenagers deal with life differently, and what they do to someone whose differences are greater than theirs… much like any normal high school these days. When push comes to shove and shove comes to blows, you’ll be surprised at how someone pushed so far will fight back. And when Carrie fights back, you’ll have wished you were on her good side.